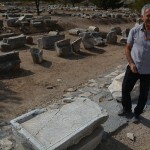 D-Marin in Didim is a new marina and very nice, however it is a bit remote with the town of Didim a few miles away. After arriving, with friends Suzanne and Bob on their boat, we all rented a car for two days. 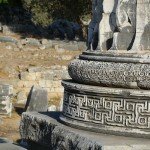 Our first short trip was to Didyma, a religious sanctuary to Apollo. 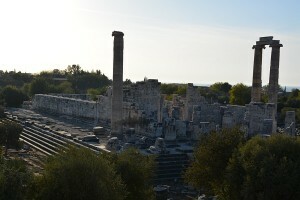 Didyma is known for having the largest Ionic temple in the world, dating from 300 BC, measuring about 400 ft by 200 ft. 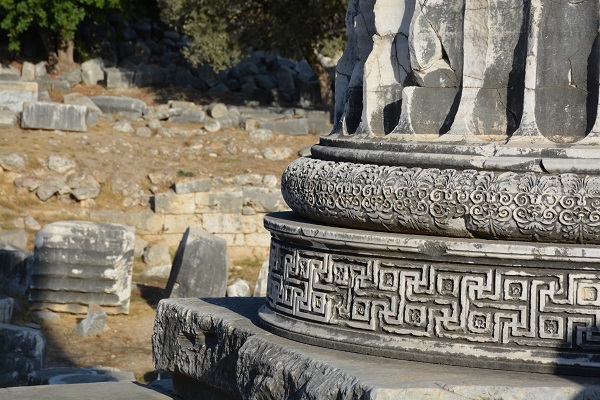 The detail of the stone reliefs have been remarkably preserved due to much of the structure being buried in the soil. 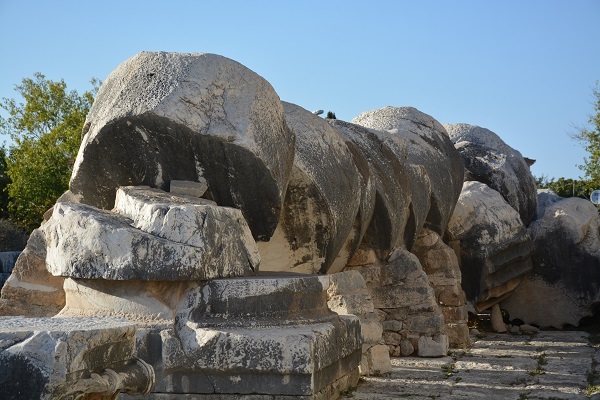 Most of the temple was destroyed by an earthquake in the 15th century, but the remaining steps that are the foundation and the five or so remaining massive columns (from the original 122) provide a sense of its original size. 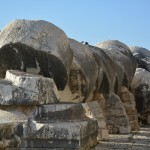 One column was secured in the position that it fell after the earthquake to give the visitors a sense of the tremendous size. We have now been there twice for sunset, which displayed a colorful glow over the ruins. 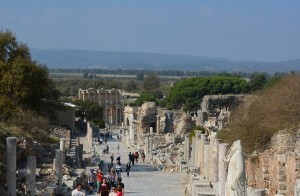 Then next day: on to Ephesus. 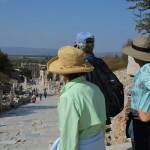 We had visited Ephesus in June and walked through the site on our own. This time, with Bob and Suzanne who had not been there before, we decided to hire a guide. It was a good decision as he brought the city and buildings more to life with his knowledge and stories. It was not expensive and we highly recommend it. He spent about two and a half hours with us then left us on our own to visit the section known as the Terrace Homes. 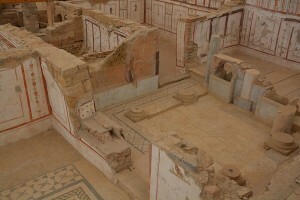 The clustered homes, still being excavated, show the sophisticated colored tile artwork throughout the private residences. 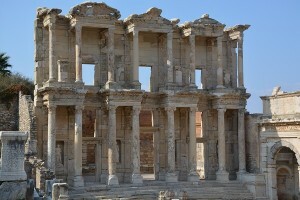 The overall site of Ephesus has been under excavation for over 150 years and is only 18% uncovered to date. 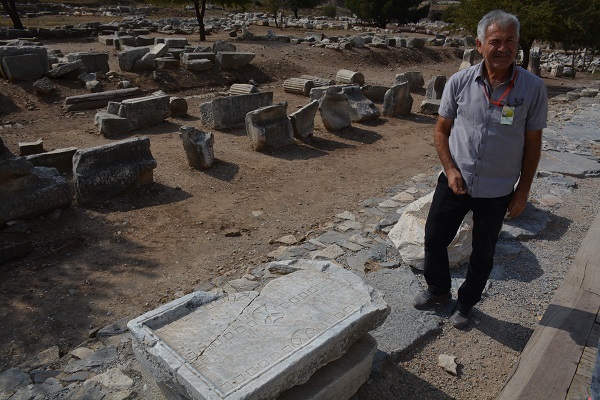 Key excavated spots include the library, theater, marketplace and latrines. 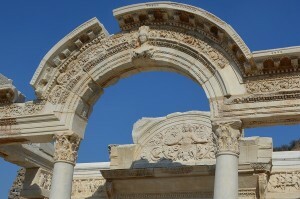 Ephesus was the capital of Roman Asia Minor, developed about 1,000 BC, and became the principle commercial city of Asia. Its large harbor was an important part of its success. The downfall of the area’s economy came when the harbor silted in and left the large and busy shipping port useless. Ephesus is also the site where St. Paul visited in AD 53 to attempt to convert the local population from paganism to Christianity. 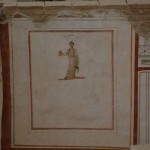 Among others, local shopkeepers earned money by selling pagan statues and saw their trade at risk. 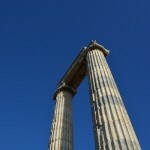 St. Paul was threatened and retreated, but continued to pursue his mission through his letters, known in the Bible as St. Paul’s letters to the Ephesians. 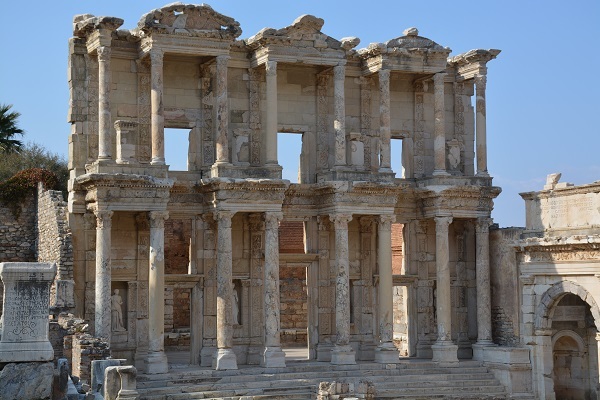 The Temple of Hadrian was one of the most detailed and beautiful examples of stone work of the late antiquity period we observed. The temple-like monument was donated to honor the Emperor Hadrian and included statues of Constantius, Maximianus and Theodosius I. 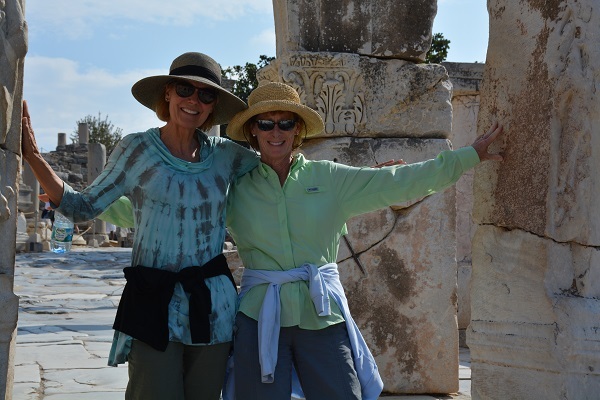 We have had a great time visiting Ephesus with our good friends and refreshing our memory of all the incredible sights at one of the most significant sights in the world. 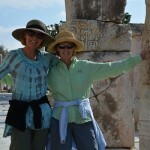 Back at Didim, it was time to say goodbye to Bob and Suzanne as they headed west into Greece and we were heading south, staying in Turkey. We hope to catch up again sooner versus later. A day later we left the marina and spent a night on the anchor off the town of Didim, where we took the dinghy ashore and explored the main part of town. We found it to be a delightful little resort town, most of it now closed as it is the end of the tourist season. 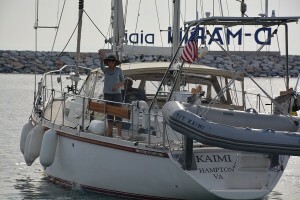 With Election Day in the US approaching we decided to check into a secured marina since there was a general concern that Americans might be subject to a backlash if things did not turn out well. 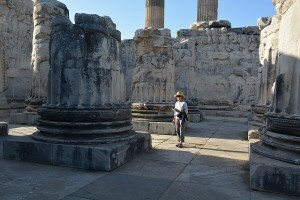 This entry was posted in 2016 Turkey / Greece Cruise, BLOG, Greece - Ephesus and tagged history. Bookmark the permalink.